One of the arguments we often use for not writing is this: “I have nothing original to say. Whatever I might say, someone else has already said it, and better than I will ever be able to.” This, however, is not a good argument for not writing. Each human person is unique and original, and nobody has lived what we have lived. Furthermore, what we have lived, we have lived not just for ourselves but for others as well. Writing can be a very creative and invigorating way to make our lives available to ourselves and to others. We have to trust that our stories deserve to be told. We may discover that the better we tell our stories the better we will want to live them. We spend a lot of time and energy raising questions. Is it worth it? It is always good to ask ourselves why we raise a question. Do we want to get useful information? Do we want to show that someone else is wrong? Do we want to conquer knowledge? Do we want to grow in wisdom? Do we want to find a way to sanctity? When we ponder these questions before asking our questions, we may discover that we need less time and energy for our questions. Perhaps we already have the information. Perhaps we don’t need to show that someone is wrong. For many questions we may learn that we already have the answers, at least if we listen carefully to our own hearts. Do you want to know God? Then learn to understand the weaknesses and imperfections of other men. But how can you understand the weaknesses of others unless you understand your own? And how can you see the meaning of your own limitations until you have received mercy from God, by which you know yourself and Him? Thomas Merton. No Man Is An Island. New York: Doubleday and Company, 1955: 214. I’ll be a Featured Reader, followed by an open mic, this Thursday, April 26, 2012 at 7 pm at Concord Writers’ Night Out at Dilworth Coffee located at 350 George W. Liles, Suite 110, Concord, NC 28127. 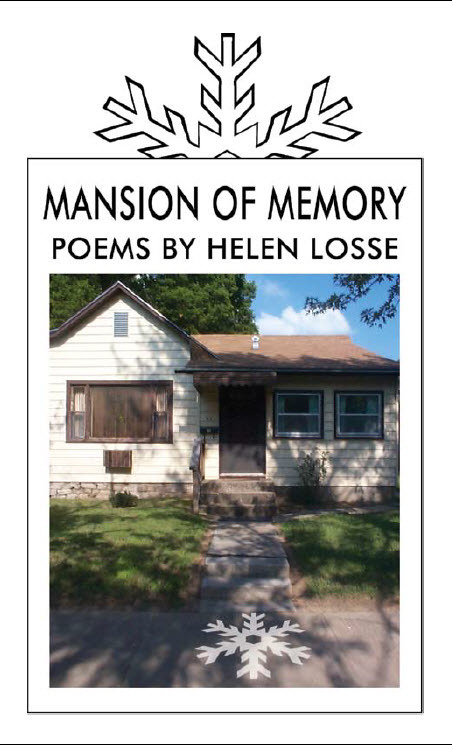 This will be my first reading from Mansion of Memory. Please join us, if you are in the area. Mansion of Memory will be available for $11. All profits will go to Bright Futures Joplin Tornado Fund. 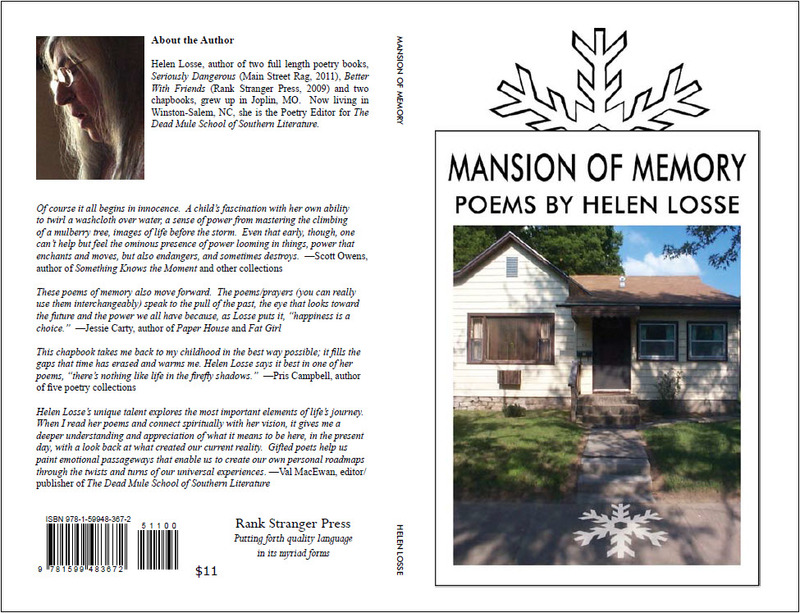 Copies are still available by mail for $13 including postage. Next week the second phase of promotion for Mansion of Memory Begins. During this phase, I will be reading at several sites. If you live in NC, please plan to join me for one of these readings. Copies of Mansion of Memory are $11. All profits go to Bright Futures Joplin Tornado Fund. When we are spiritually free, we do not have to worry about what to say or do in unexpected, difficult circumstances. When we are not concerned about what others think of us or what we will get for what we do, the right words and actions will emerge from the center of our beings because the Spirit of God, who makes us children of God and sets us free, will speak and act through us. Jesus says: “When you are handed over, do not worry about how to speak or what to say; what you are to say will be given to you when the time comes, because it is not you who will be speaking; the Spirit of your Father will be speaking in you” (Matthew 10:19-20). Let’s keep trusting the Spirit of God living within us, so that we can live freely in a world that keeps handing us over to judges and evaluators. The way to find the real “world” is not merely to measure and observe what is outside us, but to discover our own inner ground. For that is where the world is, first of all: in my deepest self. Thomas Merton. Contemplation in A World of Action (New York: Doubleday & Company, 1973): 170. Reading often means gathering information, acquiring new insight and knowledge, and mastering a new field. It can lead us to degrees, diplomas, and certificates. Spiritual reading, however, is different. It means not simply reading about spiritual things but also reading about spiritual things in a spiritual way. That requires a willingness not just to read but to be read, not just to master but to be mastered by words. As long as we read the Bible or a spiritual book simply to acquire knowledge, our reading does not help us in our spiritual lives. We can become very knowledgeable about spiritual matters without becoming truly spiritual people. As we read spiritually about spiritual things, we open our hearts to God’s voice. Sometimes we must be willing to put down the book we are reading and just listen to what God is saying to us through its words.